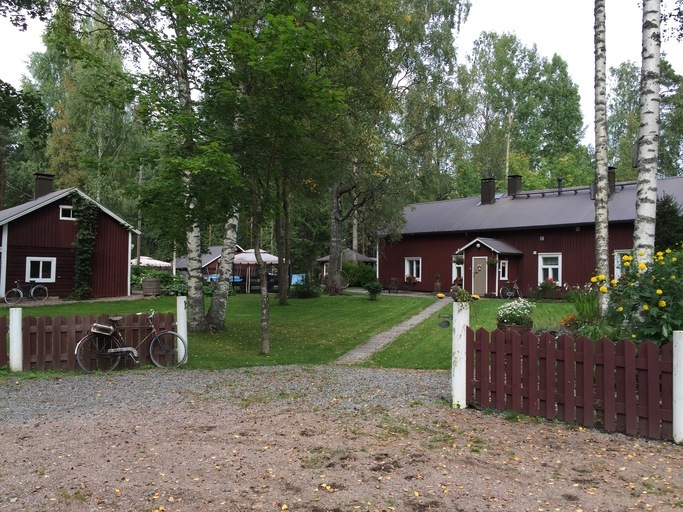 SyVilla – the cottage at Syväniemi on the shore of Lake Kovesjärvi in southern Finland − offers great opportunities for leisure and provides a lovely setting for small-scale festivities and corporate events. Forests and the natural environment are known to promote our health and well-being. The bright summer nights are a real joy and the cool winter evenings have their own special magic. A hot sauna and a swim in the lake are a glorious end to the day. 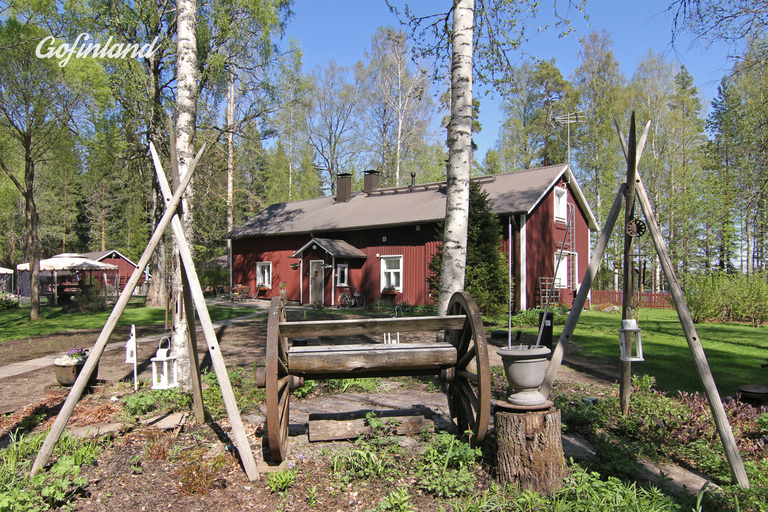 Welcome to SyVilla and enjoy the perfect peace and tranquillity of the Finnish countryside. SyVilla offers different kinds of private holiday accommodation for rent. Sleeping arrangements, depending on the time of year, allow for up to 28 guests. You can choose the appropriate accommodation to suit your own personal needs. 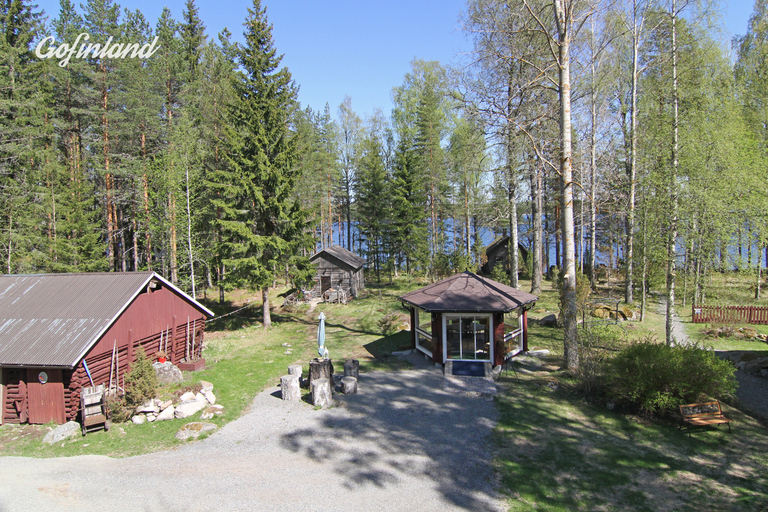 The kitchen and dining facilities in the outbuilding, as well as the lakeside sauna with its patio area and the lean-to on Pikkusaari Island are available for all the guests to use. They can be rented together or separately for particular occasions as required. The owners occasionally stay in the private quarters in the main building. They are happy to help with all your enquiries, both in Finnish and English. There are eight rooms in the main building, some of which are in the owners’ private use. The upstairs apartment has its own entrance and comprises a living room, sleeping alcove and kitchenette as well as a separate bedroom, toilet and balcony. The accommodation sleeps five people. A door from the living room opens out onto the balcony where you can admire the view of the lake. The kitchenette is equipped with a sink, fridge, electric cooker, microwave oven, electric oven, coffee maker, kettle and crockery for six people. There is a wood-burning fireplace in the living room. The apartment has a television and wireless internet connection. The guests are also welcome to use the washing machine and the shower installed in the downstairs bathroom. There are also two separate double rooms (one with a small wood-burning stove) upstairs in the main building. All the rooms upstairs have electric radiators. Downstairs in the main building there is a kitchen and sitting room as well as two rooms which are usually in private use. The kitchen is equipped with a sink, hot and cold water, an electric stove, microwave oven, two fridges and freezers, electric kettle, coffee maker, toaster and dishwasher. The kitchen and sitting room may be rented by separate agreement. Next to the main building there are two separate sleeping quarters which share a common entrance. In one of the rooms there is a double bed, a kitchenette and a wood-burning fireplace. In the other room, there are three sets of bunk beds for seven people and a farm-style dining table and benches. The old smoke sauna has been refurbished to sleep five guests. The building leads onto a lovely patio area. All of the accommodation has been equipped with electric lighting. There is also a separate outdoor toilet. The lakeside sauna was built in 2010 and is 25 square metres in area. It comprises the sauna, as well as a separate room with washing facilities and a dressing room. There is a small wood-burning fireplace in the dressing room. Five guests can comfortably bathe in the sauna at any one time. 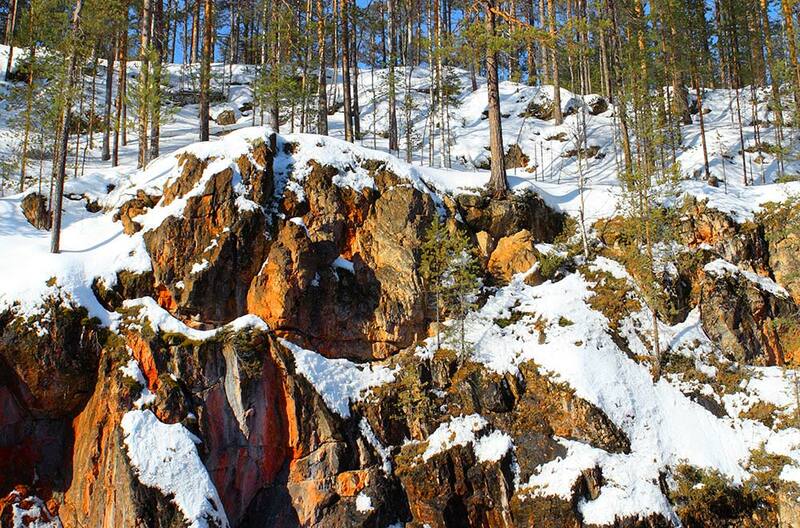 The sauna has a wood-burning stove, and the washing room is fitted with under-floor heating. During the summer season the water is electrically pumped from the lake to the washing room, but in winter the water needs to be carried inside in buckets. Above the sauna there is a sleeping loft for up to four guests. A glassed-in porch serves as a cooling-off area, above which is a small balcony that can be reached via the sleeping loft. In front of the building there is a patio area with seats, a roofed-over barbecue and a wood-heated hot tub. Steps from the patio lead straight onto the jetty. By the beach there is a terrace with a garden swing and a deck chair for relaxing. A separate outdoor toilet and a place for a campfire can also be found there. On the nearby Pikkusaari Island you can be even closer to nature by camping in the lean-to building, which sleeps up to four people. 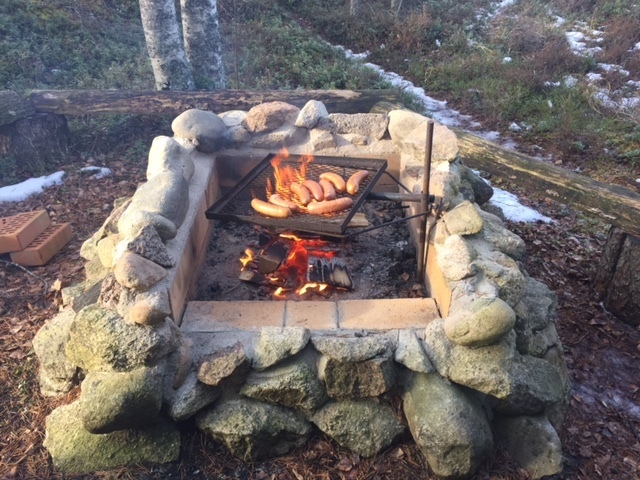 You can grill sausages and make campfire coffee in the hearth. 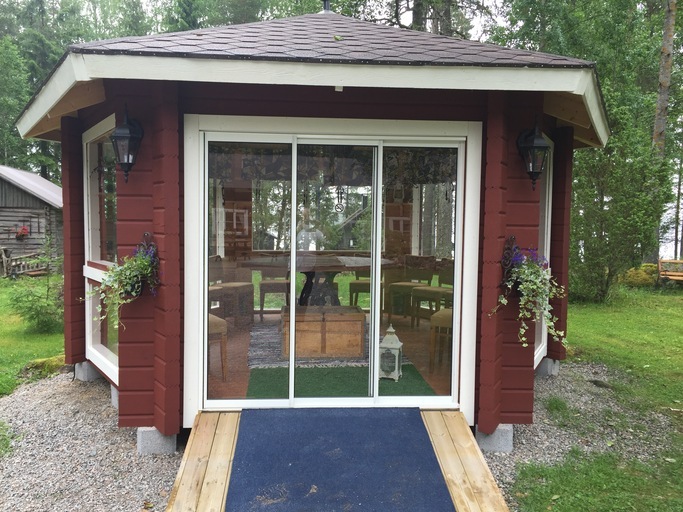 The lakeside sauna and the hot tub can be heated daily to suit your own timetable. The beach by the sauna is sandy and shallow, so it’s excellent for swimming. The building which was formerly used for storing hay for the cows has been refurbished and now serves as an idyllic dining area for up to 20 guests. It has been decorated with old, traditional items and tools which have stood the passage of time from Syväniemi’s earlier days. Karaoke equipment is available for use as entertainment. The kitchen is equipped with a sink, four fridges, a freezer, a microwave oven, gas barbecue, coffee maker, kettle and a set of crockery and cutlery. The courtyard at Syvilla has an attractive log pavilion for 15 people. The pavilion has plexiglass windows and doors. The courtyard also has two furnished outdoor areas covered with mosquito nets. Here you can enjoy summer evenings in peace from flies and mosquitoes even if it’s raining! These building can be used by guests free of charge. Driving instructions: Driving instructions: From the Parkano - Vaasa trunk road number 3, on the north side of Parkano, turn towards Karvia, road number 274. After driving for approximately 11.5 km towards Karvia, turn left onto Syväniementie (Syväniemen metsätie). Follow the road for 1190 metres, then take a left turn towards Syväniemi as signposted. Drive for a further 470 metres until you see SyVilla on the left.